If you've followed and acted upon our guide to making your own contact mics, you might now be wondering exactly what it is you should now be doing with the resultant devices. Well, how about some capturing some weird sounds and mangling the bleedin' life out of them, for starters..? For more on piezo microphones, pick up (geddit?) Future Music 295, which is on sale now. Step 1: We start by recording the sound of a couple of marbles being rolled around the bottom half of a pair of hi-hats. The contact mic is taped to the inside of the cymbal to show it in the photo, but normally we'd put it on the underside, out of the way. Step 2: We're going to start quite simply and lower the pitch of the sound to create some deeper metallic tones. This is done with Sonic Charge's excellent Echobode frequency shifter. We then add a touch of stereo delay for movement via Rob Papen's RP-Delay plugin. Step 3: Next, we take the raw sample again, reverse it, run it through a hall reverb and reverse it back again. Then we use Echobode, this time to add some flanging and raise the pitch, followed by some more reverb and a touch of distortion, for a sci-fi hum/lazer-style texture. Step 4: Here's the same sample again, lowered six semitones in Logic's pitchshifter. Then we add some short delay using Logic's built-in echo plugin, and finish things off with a run through the ring modulator, which gives the end result a 'vocal' quality. Step 5: Here's a little passive shaker box thrown through some Moogerfoogers The shaker box goes straight to the ring modulator to mangle those frequencies, then into a low-pass filter (modulated by the LFO of the ring mod), phaser and, finally, analogue delay. The passive shaker box is simply a plastic PCB enclosure box (or whatever you have to hand) with a piezo stuck inside connected to an output socket on the side (we've used a mono RCA). The box is simply part filled with something that will make a shaking sound (we've used plastic BB gun pellets). 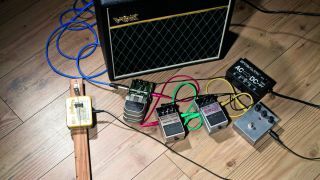 Step 6: Here's the shaker box again, but this time put through some guitar pedals: Modded Daddy O overdrive first, to crunch up the sound, then into the Boss bass synth with the mix 100% wet, then the phaser, and, finally, a swept stereo delay for some extra movement.